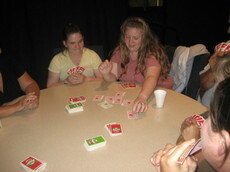 Last night we finished up our series, The Games We Play, with an all-church game night. If you’ve ever played games with Rachel and I before, you know we’re competitive! It was loads of fun. We had a couple of Wii’s there. 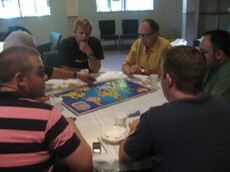 A group of guys played some RISK all night (I have no idea when they left or if they ever finished the game). I saw some Clue going on. 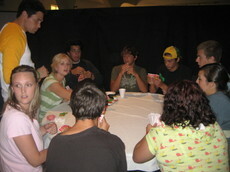 And of course the games I enjoyed were Pit and Apples to Apples…both excellent group games. 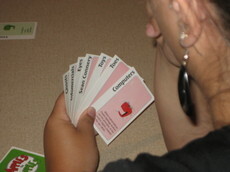 And I did finally win on the third game of Apples to Apples. And one of my personal favorite moments was watching the "girl fight" as Julie and Georgina took on some Wii boxing. Check out the video below to experience it yourself! We missed you and Rachel at our game night at your mom’s on Sunday. We played Phase 10, the game you got us hooked on at Lawrence Welk’s last year. We will miss you guys this year. Tell your sis if she should get any of those other games for us to play that you were talking about, like apples to apples. Oh yeah, small detail….Mego was the winner!!! I think her and Tim cheat, because if there is a strategy to the game, I haven’t figured it out yet!! !